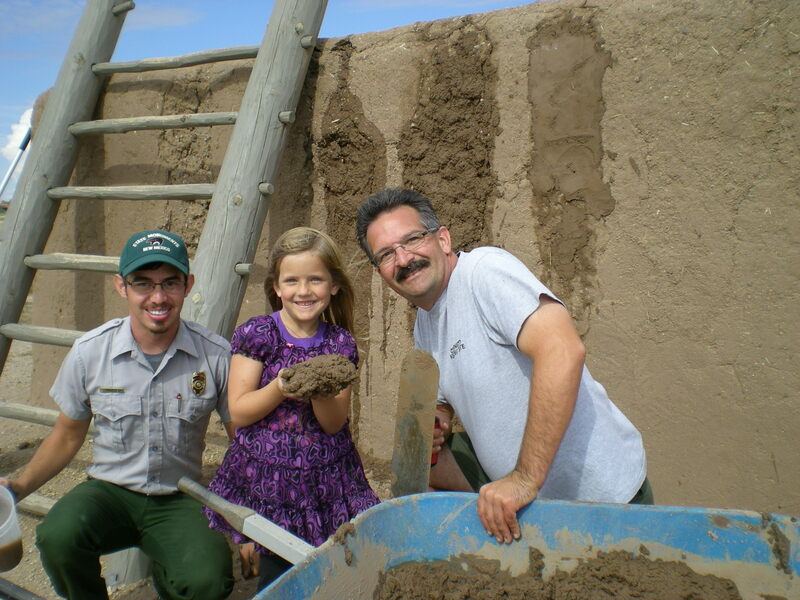 Almost all of the structures at Coronado Historic Site are made out of adobe and mud plaster. As a result, every time it rains some of our buildings literally melt away. So historic preservation at Coronado can be very messy, fortunately everyone loves to play in the mud, so we get tons of help from the public. On this particular day Mila Huber, age 5, was on a tour with her parents, and was very interested in what Ranger John and Ranger Ethan were doing. Mila politely asked if she could help out, and her mother agreed. Mila took to the mud throwing technique like a duck to water. She was very helpful, and we welcome her back any time to help us “play in the mud”. Thank you for your help Mila! Tags: Adobe, Coronado Historic Site, Kuaua, Mud Plaster, Native American, New Mexico, Plaster, Pueblo, Ranger Ethan, Ranger John, Southwest. Bookmark the permalink.